We have been helping to transform organizations and individuals for over 25 years – Inspiring learners in over 90 countries worldwide. At the heart of our approach is the goal of making working life better. Hemsley Fraser has operations in the UK, USA and Germany and learning and development programs that are delivered around the globe. Using our ‘excite, engage & embed’ approach, we ensure our digital, blended and face-to-face training programs truly engage learners and make a difference to the businesses. Our core library of on/demand digital assets and expert-led content, enables organizations to quickly pick and mix what they want. Whether it’s creating a blended learning solution that provides immediate relevance & application to job, on-demand solutions that put learning at our client’s fingertips, or developing experiential learning offerings that drive team bonds, we are motivated to push boundaries. Our innovation and constant need to look for better ways of doing things is central to our approach and impacts all of our learning and development services. We pride ourselves on providing content and client solutions across the full spectrum of learning subjects, but perhaps Hemsley Fraser is best known for our personal effectiveness and front-line leadership programs, and particularly our ability to deploy customized client solutions on a global scale. Our belief has long been that these learning solutions must be relevant and contextualized for the client (‘what does it mean to be a professional or leader here’) and must offer significant blended learning components, to ensure that behaviors are embedded and sustained. Innovation is at the heart of all that we undertake in Hemsley Fraser (HF), and we pride ourselves not only on our ability to innovate, but the pace at which we can bring concepts to life. Below are some examples of how we are ensuring that the entire learning and development process, from design to execution, is as engaging as it can be. Client Design Process – HF has completely re-imagined the client planning and instructional design process. Our dedicated client experience centers have been specifically designed to ensure easy content review, fast-paced design, and maximum collaboration. Our Client Decks (London, Washington DC and Frankfurt), ensure that our clients can approach instructional design in a more creative and collaborative manner, and greatly speed along the design and development process. View our client deck co-creation video on YouTube. Core/Digital Learning Hub – We have created a ground-breaking approach to intellectual property management, which enables clients to quickly build self-directed or blended programs for their teams, quickly and cost effectively. Our learning assets are conveniently housed in one easy-to-access digital platform (http://thehfvault.com/NBA/HF-Innovation-Story/assets/core.mp4 ). This highly visual approach to content navigation makes designing tailored learning solutions a breeze – digital learning assets (videos, animations, interactive digital books & infographics), as well as virtual and face-to-face training materials – all available to design a solution that is unique to the business. Fluidbook library – Our unique digital books continue to delight clients, and we now offer a full library of these highly engaging learning tools. Fluidbooks combine multiple ways of learning in one space, keeping the learner engaged for a longer period. Whether learners prefer to read, watch, or try it out, each fluidbook is designed to connect with all learning styles. 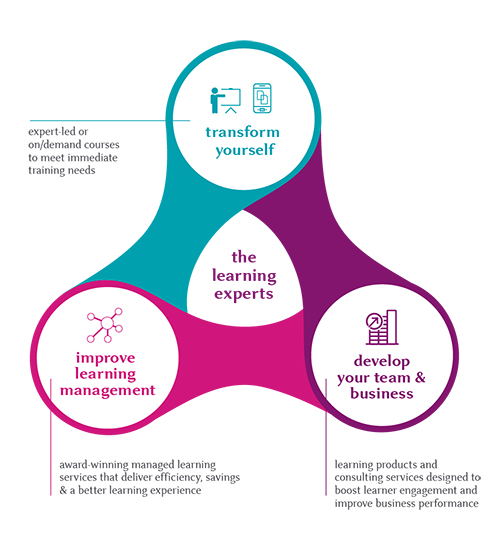 Thrive in Five – Our new mobile learning offering, follows a set methodology that teaches practical solutions for common business situations, all in five steps. This highly engaging series is perfectly suited to mobile, with video and animation backdrops that work on smaller devices. At no longer than 3 minutes, these solutions also cater to trends in micro-learning. Wizards – Client demand for graphics, production, and digital editorial services is at an all-time high, as the production quality is so important to the overall learning effectiveness. Our ‘Wizards’ team – an in-house team of production and graphics personnel ready to mobilize on any client need – are bringing ‘a touch of magic’ to learning content, making it more appealing and accessible to users. HF Garage – To ensure that our innovations are truly focused on the next generation, we are proud to have opened the HF ‘garage’ in 2016 – a Silicon-Valley inspired development laboratory, located in our central London facility. This Garage combines the breaking technologies with college interns to explore the next great innovations in learning… VR learning, adaptive learning, mobile…. To see the HF Garage, what this short video http://thehfvault.com/NBA/HF-Innovation-Story/assets/garage.mp4. Do you need to modernise the learning and development your organization provides, to meet the changing expectations of learners? Hemsley Fraser can help. We take a holistic approach to managed learning outsourcing, to ensure our clients get just what they need? We’ve even created an online learning hub to make it easy to access content. Our aim is to make the learning experience as good as it can be. Our flexible setup means we can quickly deploy just what’s needed, helping make immediate savings. Whatever the size or stage of your business, Hemsley Fraser can help transform what you do. We pride ourselves on the positive impact our service has… helping future growth and success. As experts in learning, we take the pain of training administration away, so businesses can focus on what they’re best at. Whether you’d like our support with learning strategy, supplier management, admin and logistics, metrics or to get access to innovative learning content… our role is to help you accelerate business performance. Our fast-moving, just in time, approach means your learners get the right learning experience to meet the needs of the organisation now and into the future. US: 1-888-559-0074 or visit www.hemsleyfraser.com.